Browse: Home / 2012 / July / 26 / Peep! I saw a brilliant movie the other day. It featured a highly sophisticated critique of both the prevailing intellectualism and the corporately hijacked political elite. Its protagonists presented in part woolly, but mostly toothy arguments supporting the view that our system is undeniably adrift and we are headed for imminent disaster. 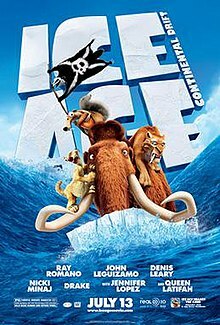 The name of the movie was Ice Age 4: Continental Drift. The animal friends from the earlier three movies return in a swashbuckling adventure as their continent breaks apart, and they engage in an involuntary adventure to survive at the high seas, battling nutty pirates and other sea creatures. This is exactly the kind of movie mr Zizek should analyse, and I asked him here on his facebook to do so. Two possums, Crash and Eddie, launch themselves for fun from a cliff, climbing on top of high pine trees that give way under their weight and smack them next to, and partly on top of, a molehog whose name I forgot. That commentary, “peep!” seems all there is to say about the situation of our civilization. We are the weasels (with the difference that we are actually causing our disaster) saying “peep!” pinching the nose of anyone (scientists, activists, permaculturalists, vegans, leftists alike) who seems to spoil the party by expressing all too serious concerns. Our “culture of make believe” (Jensen) is what has brought us here. Every serious question we raise about the party (which is, of course, the paradigm of economic growth and the whole destruction in its wake) is more inconvenient than the most inconvenient truth – because “truths” don’t exist anyway in the postmodern consumerist endgame. It is so much easier to sympathize with the “peep!”-sayers than with the Cassandras and those foreboding destruction . Indeed, the creatures in the movie have had mine from the start. I think this is an extremely powerful rhetoric device and we must find a way for it to work in favor of the resistance and against the status quo. How? Well, our enemy does have concerns: They care a lot about money. So let’s say a CEO of a big bank or corporation is denied a bonus, made some really bad personal investments and goes broke.